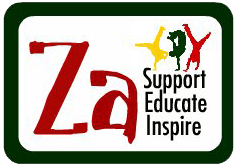 Following the success of our Za Foundation Christmas gift card last year, we have designed a new card for 2017! The idea is that for £5 you can pay for a vulnerable child or orphan who attends one of our after school clubs to have a meal during the Christmas season. In return, you receive a postcard which you can then give to someone else. 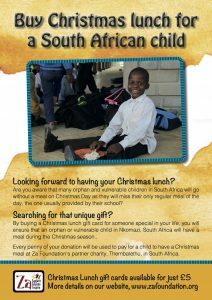 In effect, rather than buying a present for that person, you are buying a lunch (which the card explains). It would be a lovely stocking filler or Christmas card idea for someone special or even a ‘secret Santa’ gift! To buy a card, please email us at info@zafoundation to express your interest. We’ll then take it from there. Alternatively, cards will be available to buy in Morgan-Westley, 28-30 High Street, Portishead, Bristol, BS20 6EN.